The reason I call this my most unusual game is because the moves were identical to those of a game I had played some five years previously. Both of my opponents were graded in the high 130s. The first game was played in the Stevenson against Chislehurst in 1984 and the second in the London Business House League in 1989. Both of my opponents made the same bad moves and ended up being mated on move 12. When the team captain checked my clock in the second game he found that I had used less than 2 minutes of my time to my opponent’s 24 minutes. 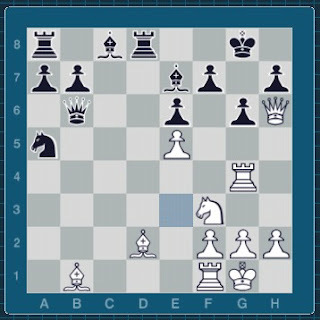 I was playing the White pieces and the game went as follows, the opening was a variation of the two knights defence known as the Fegatello or more commonly the Fried Liver! For two experiences club players to make exactly the same mistakes in a competition game is very unusual and I doubt it will ever happen to me again. The 2008-9 Kent League season started with a 4-2 win over Chislehurst in the Harvey Cup. In this position from the match, white (to play) can win by playing Ng5, but there is a more spectacular (though not necessarily better) way to win. 1.Rxg6+ fxg6 2.Bxg6 hxg6 3.Qxg6+ Kh8 4.Ng5 Bxg5 5.Bxg5 Rf8 6.Bf6+ Rxf6 7.exf6 Qc7 8.f7 and checkmate (on one of three squares) can only be stopped by giving up the queen for the advanced pawn, after which black will soon be mated, so black resigns 1-0.